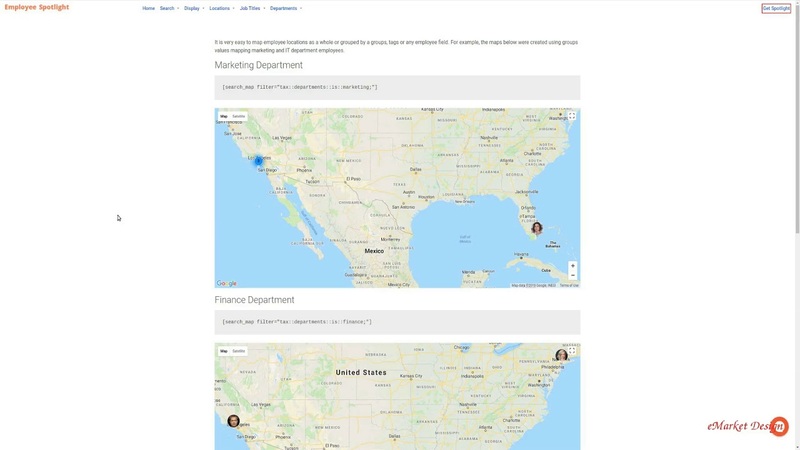 Employee Spotlight lets you map primary address of an employee or multiple employees on google maps. Employee Spotlight mapping view helps your customers, partners or staff members locate individual employees or office locations on google maps. You can use WordPress shortcodes to display any segment of your employees. For example, you can create a shorcode for marketing department employees and display them on a WordPress page. Initial map view covers all locations on page load. If there are multiple employees sharing the same address, the total number of employees located at that address is displayed. Clicking on an employee marker display summary information. Summary info photo is linked to the profile page of that employee. Multiple maps can be displayed on the same WordPress page.